Finance ministers from the Group of Eight meet Friday, with issues such as the influence of hedge funds and the weak dollar on their minds. 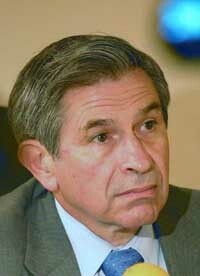 But the furor over World Bank President Paul Wolfowitz could overshadow the talks. Officially, the embattled bank head is to give a speech on corruption - but he may instead resign. People familiar with the negotiations said he was seeking a face-saving agreement Wednesday that would allow him to step down on his own terms and escape some blame for the conflict of interest involving a generous pay deal for his girlfriend. Deliberations by the bank's board were to resume Thursday morning. Wolfowitz canceled a planned trip to a bank-sponsored development conference in Slovenia, on Thursday and Friday to work with the board. But the German Ministry of Finance said Thursday that Wolfowitz was still expected to attend the meeting in Potsdam on Friday and Saturday, which is supposed to set the agenda for next month's summit of G-8 leaders. "We did not receive a cancellation," spokesman Torsten Albig said. Wolfowitz, accused of breaking conflict-of-interest rules in his handling of the 2005 pay package of bank employee Shaha Riza, has maintained that he acted in good faith, but the admission has led to louder calls for his dismissal or resignation. European members - led by France, Germany and the Netherlands - are pushing for him to resign. German media quoted Development Minister Heidemarie Wieczorek-Zeul as saying Wednesday that Wolfowitz "would do the bank and himself a great service if he resigned. That would be the best for all involved." On paper, the finance officials from Britain, Canada, France, Germany, Italy, Japan, the United States and Russia were to hash out factors affecting the global economy, with a focus on hedge funds the primary issue. Concerns about foreign currency exchange rates - the rising euro, weak dollar and China's yuan - are likely to be talked about as well but on the sidelines. German officials have made tighter supervision of hedge funds a focus and has been agitating for a voluntary code of conduct in light of the rapid expansion of the funds, which carry high risks and are often exempt from rules and regulations. The debate became more political in Germany after a hedge fund forced Deutsche Boerse Chief Executive Werner Seifert to step down in 2005 in a dispute over the German stock exchange's attempt to take over the London Stock Exchange. Labor Minister Franz Muentefering of the Social Democrat Party likened hedge funds to locusts. But the issue is contentious with some G-8 members, including Britain and the United States, on the fence over such a code. In April finance ministers met with hedge fund representatives in an outreach session of sorts. The German Finance Ministry said this week that Germany would stick to its aim for a voluntary code of conduct - and that even if the final statement of the meeting does not mention it, that is not a sign it won't be in the communique from June summit. Clay Lowery, the assistant U.S. treasury secretary for international affairs, said Wednesday he believed disagreements had been overemphasized in media reports. He said he believed common ground could be found among the ministers this weekend. "There probably is not as much disagreement as people have made it out to be," Lowery said, adding the U.S. still held the view that a conduct code was unnecessary. "We think that industry best practices is probably the best way to get to better market discipline," he said. Any talk of foreign exchange rates will be on the sidelines of the meeting, the ministry said, since central bankers will not be attending this time. In April, a statement from the Group of Seven finance ministers and central banks said that "excess volatility and disorderly movements in exchange rates are undesirable for economic growth." Since then, the dollar has been on the low end of currency fluctuations, falling to a record low against the euro of US$1.3682 on April 27 and hitting 27-year lows against the British pound and new lows versus the Chinese yuan, too. The pound crossed the US$2 mark in April and later reached a 26-year high against the dollar. Masato Miyazaki, an official in charge of the Japanese Finance Ministry's section on international organizations, said his country is likely to stress the need to fight global warming and conserve energy. "We will likely reiterate our position that it's important to save energy, set up a post-Kyoto framework because it is meaningless without the participation of the U.S., China and India," he said. The meeting will take place without U.S. Treasury Secretary Henry Paulson, who will be staying in Washington to focus on meetings with Chinese officials next week. Deputy U.S. Treasury Secretary Robert Kimmitt will attend instead. France has not said if it will send a representative. New President Nicolas Sarkozy's finance minister was expected to be named Friday with the rest of the Cabinet.